This 1860s mining town is said to be the home of many spirits. The abandoned town 40 miles outside of Missoula was named after garnets, the first stone mined here, although gold became the real draw. Disembodied voices have been heard here, and several apparitions have been seen. The many ghosts reputed to reside here include not only gold miners, but also a woman who is said to have been executed for murder here. As Garnet was famous for its 13 saloons, loud music has also been heard at times. Your site confuses me. 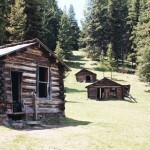 The Garnet ghost town in Montana isn’t very close to Drummond like you say it is – in fact, it’s almost 100 miles away. Might be 14 miles as the crow flies, but there are no roads over the mountains and it is private land, meaning no trespassers are allowed to go hiking between those two towns. Drummond is in Granite County, where Garnet is in Missoula county, nearer to the Lewis and Clark county line. It take an hour and a half to drive from Drummond to Garnet and only about 40 minutes from Missoula. This is a state park and it has hours of visitation posted on the signs directing travellers to Garnet. Closed at night and during the winter when it’s not safe to visit. We were just there last night. It is about 10 miles to Bear Gulch and about 11-12 miles up a narrow dirt road to the town. The park is NOT locked up at night, though it is actually not open at night. It was only about twenty miles total from Drummond, but it takes along time to get up to the town. The town sits at 6000 feet, and at a couple of spots, you can see all the way down! ALL THE WAY DOWN!!! When we got back to the frontage road, it was about 33 miles into Missoula. I have no idea what you’re talking about here. Yes, the road to the town is surrounded by privet property, but all you have to do is, stay on the road. Garnet Ghost Town is pretty much right where the sites say it is. It is a nasty climb on very narrow switch backs, you’ll want a 4×4 just in case, but it is a very cool place. We could hear the noise from the near by, still active, mine and it’s really REALLY dark after night fall. The park IS actually open in the winter! You can even rent cabins in the winter, but you need snowmobiles to reach the town in the winter months. My grandmother lived in this town as a very young child with her 2 sisters and mother. I recently visited during the day and I was in the home of a rumored “executed” witch. It felt as if I was not alone. I began to recite the Lord’s Prayer because I felt it was necessary, and then I heard a low groaning / growl sound. I proceeded outside and the streets were empty. As I turned around, I thought I saw a young, beautiful woman im the doorway, then I got dizzy and fell. This is the most interaction I’ve had in a paranormal situation. This town is a MUST visit. I was there a few years ago and it was late fall so there were only a few people there. As I was walking I suddenly heard loud piano music. The piano sounded like an old player piano. I thought maybe someone was putting on a performance but after investigating, no one was there playing. I was very puzzled and asked another person about the music and they said they didn’t hear any and we were the only people up there that day.